Between one exact month will be Christmas. It is a very special celebration, this is undeniable. I'm working on several projects Christmas to tell the truth many of them are gifts that I will give to my family and my friends. 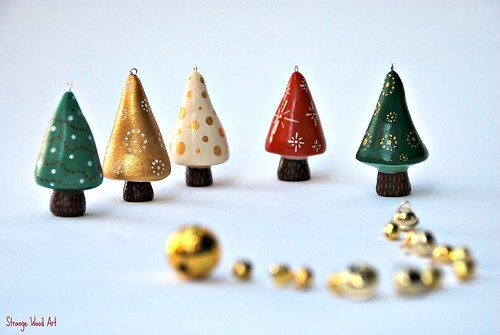 In my shop you will find these little decorations to hang on the Christmas Tree. 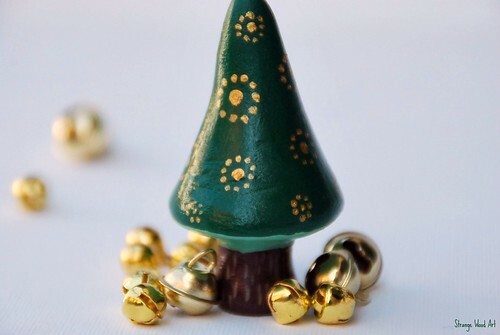 I decided to do a giveaway ... a Christmas giveaway to win one of these little trees. You can see it, in the first and in the last photo. Tra un mese esatto sarà Natale. E' una festa davvero speciale, questo è innegabile. Sto lavorando a molti progetti natalizi, a dire il vero molti sono regali che darò alla mia famiglia e ai miei amici. Nel mio shop potrete trovare queste piccole decorazioni da appendere all'Albero di Natale. Ho pensato di fare un giveaway...un Christmas giveaway per vincere uno di questi piccoli alberi. Puoi vederlo nella prima fotografia e nell'ultima. All you need to do is leave a comment to this post and tell me what gift you would definitely receive this Christmas. If you want or you can, leave a link to this post, thanks! The winner will be announced Sunday, December 4. Comments are also open to anonymous users. But please, leave your name or an email to be contacted in case of winning. Happy weekend to all and good luck! Tutto quello che dovete fare è lasciare un commento a questo post e dirmi quale regalo vorreste assolutamente ricevere questo Natale. Se volete o potete, lasciate un link a questo post,grazie! Il vincitore sarà annunciato Domenica 4 dicembre. I commenti sono aperti anche agli utenti anonimi. Ma per favore, lasciate il vostro nome oppure una mail per essere contattati in caso di vincita. Felice weekend a tutti e buona fortuna! 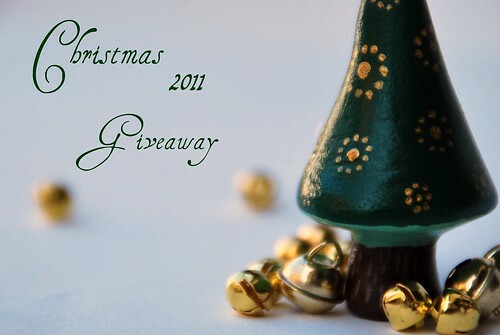 Un abbraccio Linda, e nel prossimo post cito il tuo GiveAway! Linda che meraviglia queste decorazioni!!!! Io per Natale voglio la macchinetta fotografica nuova! Ma bella, mica di quelle da pochi soldi! Complimenti per le tue creazioni e spero di vincere io!! caro Babbo Natale...vorrei uno studio tutto per me con una grande vetrata che da' sulle montagne innevate....:OP e un albero di strange of course! Come sono belli bellissimi!!!! A me piacerebbe + di tutti quello rosso naturalmente! Compliments . Quest'anno spero sarà un Natale un pò "Speciale"
io vorrei...un bel torchio per fare le incisioni! ma ci conto poco poco!!! Per natale vorrei poter partire! andare a fare un bel viaggio** soprattutto sarebbe bello partire con gli amici! io per Natale vorrei alcuni libri di cucito che ho già addocchiato! Bellissimi, mi piace il verde o il rosso. Per Natale vorrei solo serenità dopo un periodo un po' tempestoso. X QUESTO NATALE VORREI LA SALUTE NELLA MIA FAMIGLIA. il regalo di Natale già l'hoo ricevuto..hihihi una reflex Canon! The gift I will be receiving is the gift of a clean backyard. My friend is coming back during the holidays to help my family clean up and plan the garden for a beautiful place to hang out in the spring and summer! Oh, the sweetness of a green garden! questo natale vorrei ricevere...una proposta di matrimonio! Non potevo assolutamente mancare al primo giveaway natalizio del 2011! Allora, il mio regalo più desiderato sarebbe una notte di...sonno intero!!!! 8 ore di sonno ininterrotte... che meraviglia... che dici, Babbo Natale mi accontenterà?! I am firstly hoping for some snow so that my visitors from Australia won't be disappointed when they come for christmas and secondly I am hoping for a new Polaroid camera which prints out photos immediately. I remember we had one when I was a child and it was always so exciting waiting to see what would appear - polaroid photos just look different! Amazon is selling the new Polaroid 300 in great colours like bright blue and red - fingers crossed that Santa remembers me this year!! Thank you for this lovely giveaway and I wish you an amazing new year full of piece, joy and good things only! I will be getting my mother's delicious cookies. She has been baking the same chocolate chip, sugar, and Chinese almond cookies since I was a baby, every year without fail. My brother and sisters, and now our children, remember only the cookies year after year, after all the other gifts are opened and enjoyed. It isn't Christmas without them. Sono felice e serena...cosa potrei chiedere di più? This Christmas, I will definitely be receiving socks from my kids! The 3 and 5 year old came up with a plan for fuzzy socks and told me all about it! My husband is getting shaving cream :). Their little faces are so bright with all of this excitement-it doesn't even matter that they don't keep anything a surprise! Thank you for the chance to win-hope I entered correctly. I did share this link on google plus. Questo Natale...vorrei che ci portasse tanta salute...e naturalmente un alberello di Strange! e ti seguo come Fabulosity.